Randy asks Chipper Bro which 3 players he’d choose to play with under some very specific conditions. They give their regards to their friend and fellow freestyler, Dave Bailey, who recently passed away. Find out Chipper’s favorite tricks and how they make him feel. Can anyone guess Chipper’s preferred kitchen utensil? Hear how fabulous frisbee tricks facilitated the federales putting down their guns and other wild stories. Chip closes out with some touching sentiments! Several weeks ago, there was a guest that did the intro… Who done it, you ask? It was Eduardo Turri from Rovereto, Italy. We got lots of good guesses, but no one got it right. Thanks to everyone that helped make City vs City a success. The finals between NYC and Berlin were close, but in the end, Berlin walked away with the keys to the city of Heinsville and they will wear the crown for 2019. Frisbeer is coming up in early March, and if you’re not going to be there in person, we hope you’ll tune in for the live stream on frisbeeguru.com. Full write up in progress…enjoy!! City vs City 2019 Finals are almost upon us: Feb 9 @ 2p EST/8p CET. It’s time to find out who will be crowed the heinest city for 2019. In one corner we have New York City. New York made a strong showing in Round 1, with back and forth scoring. They had a few early drops but mostly their play was exciting and on the edge. They also came with some choreography for the opening CoOp and Pairs battles, ending with the patented leg trap. In the other corner we have Berlin. In Round 2 they started off slow, losing the opening rounds but then brought the hammer in 1v1, with zero mistakes or hesitation. In 1v1 they showed a high level of creativity and tradition “hein”, with multiple spinning combos and huge catches. New York’s keys to victory will be to take control early, and dictate the pace. If they can take CoOp and Pairs and then continue to shred into 1v1, they could run away with an early win before Berlin has a chance to show all their skills. If Berlin starts winning battles, New York will have its work cut out to keep up. Having a 2 point lead going into 1v1 could make a big difference. Berlin’s keys to victory are to weather the early storm, and pull ahead at the end. If Berlin plays as they did in Round 2, there may a be a turning point moment where they score a key victory. At this point, strategically choosing players and shredding will put the pressure on New York. If New York cracks, Berlin could end up a stronger roster near the end of 1v1 and ultimately winning. What do you think are the keys to victory for each city? Berlin moves on to the finals on Feb 9, 2019. Don’t miss it. Although they had a streak of winning in the co-op division, Dave and Arthur had to go back to the drawing board to start winning in pairs. Find out what cool thing ties Jake, Randy, Dave, & Arthur together. Hear them share memories about competing in unpredictable weather conditions. Find out why Dave and Arthur eventually stopped playing together. City vs City Finals are next Saturday, Feb. 9th, 2pm, eastern standard time. Tune in to watch Berlin and NYC battle it out. Who will win the Crown of Heinsville and who will be the Mayor for 2019? City vs City: Round 2 – Bologna vs Berlin – Who Will Make the Finals? With Round 1 in the books, it’s time to find out who will face New York in the finals on Feb 9th. In one corner we have Bologna, Italy. They were the winners of last years, City vs City test against Seattle. They have experience on their side, and deep pockets to boot. In the other corner we have Berlin, Germany. While this is their first online battle, it could be argued that some of the most talented Freestyle Frisbee players in the world reside in Berlin these days. You’ll have to tune in tomorrow, 1/26/2019 @ 6:00p UTC+1 / 8:00a PST to find out who will move on. New York City moves on to the finals on Feb 9, 2019. Don’t miss it. Fabio talks about what it was like to be at the beginning of the Frisbee wave in Europe. Fabio says Tommy was the fertilizer that made it grow in Italy. He shares his inspiration for the many videos he created on a website he developed before YouTube, which in turn, inspired many other players. But as a loner spending so much time practicing, he (& others) questioned if he was wasting his time. We clearly know the answer to that! Fabio of course loves to win but shares his insights on what can be gained from losing. Prize money? Fabio doesn’t think we need it, but he likes the idea of contributing more funds towards growing the sport. Jake, Randy, & Fabio have a in depth discussion on the pros and cons. 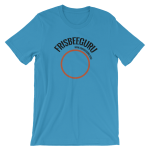 You may have noticed that a talented guest did the intro… the first person who guesses who it is, will receive a Frisbee Guru t-shirt. Please tune in to the City vs. City battle on January 12th at 2p.m. eastern time (USA) when NYC takes on Medellin. The next battle will be on January 26th, when Bologna takes on Berlin. The finals will take place on February 9th. 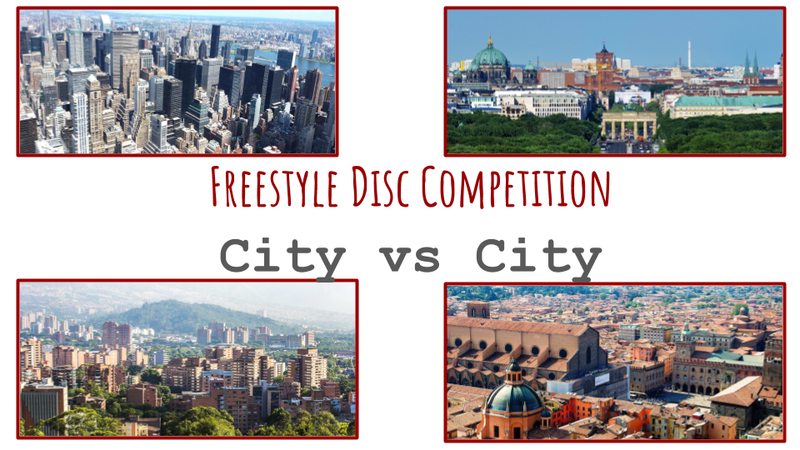 It’s been just over a year since the first ever City vs City online Freestyle Flying disc competition. That event was a test to see if the concept could work. With it’s success, we began planning for the next iteration. And now, it’s official: City vs City Championships 2019 are now scheduled for the early part of 2019. Four cities from four different countries and three different continents are slated to compete for the Most Hein City for 2019! Which cities have thrown down the gauntlet and put their City on the line? New York (USA), Medellin (Colombia), Berlin (Germany), and Bologna (Italy). Tune in here to watch. Each city will put forth 5 champions to represent their honor. Players will compete in a head-to-head / battle style format as individuals and as groups to earn points for their city. Three (3) judges watching via an online video conference, will assess the play, and determine during each battle which team or player won that round. 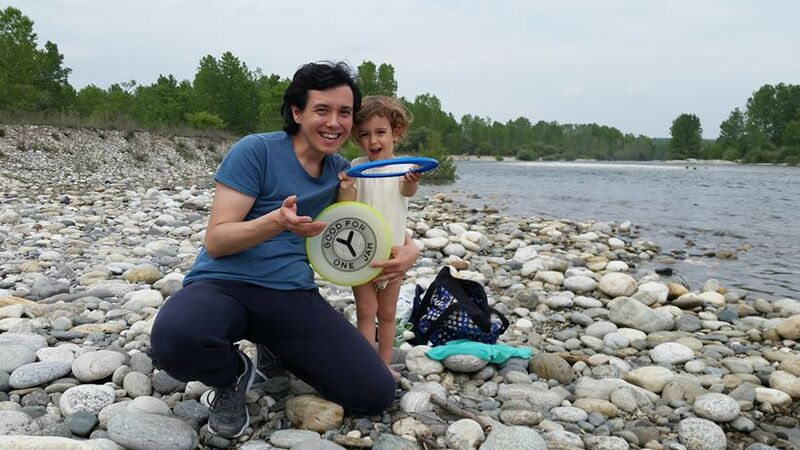 This year’s 2019 judges are all members of the Freestyle Flying Disc Hall of Fame and may use any criteria they see fit based on their Hall of Faming expertise. The player’s job is to go out and “shred to impress” the judges. All locations will be connected via a web based video conference. Each location can see every other location in the conference. The locations: City 1, City 2, The Frisbeeguru Tech Room (the hosts). Music will be played by the Frisbeeguru Tech Room, through the video conference. Judges will join in a separate conference where they will see exactly what the live stream audience sees. From there, judges can confer and render a vote. The contest consist of a Co-Op team battle, a Pairs team battle, and five 1v1 battles. Each battle is worth 1 point, for a total possible 7 points. The judges watch each team/player and choose a winner. There is only one chance to play each battle, so players have to their A games. There is also a bit of strategy involved. Each battle has a choice: pick first or play first. The competition will run like this…. The event begins with a disc toss. The winning city will get to decide: pick first or play first. Example: City B wins the toss and chooses to pick first. Now, City B will identify their Co-Op team and Pairs team. Next, City A will identify their Co-op and Pairs teams and may opt to adjust their teams based on the composition of City B’s teams. Co-Op begins. Since City A picked second, their Co-op team will play first with each team playing 3 minutes. At the end, the judges will render a vote for a the team they feel played the best. The team with the most votes wins 1 point. Next up is pairs. The losing Co-Op team may choose to play first or second. There is no “pick” in this round because both teams were decided previously. The Pairs teams will play for 2 minutes. At the end, judges will render a vote for the team they feel played the best. The team with the most votes wins 1 point. Finally, teams will play in a 1v1 battle format. The losing team the previous round (Pairs or the last Battle of 1v1) will choose; pick first or play first. For example: If City A chooses to play first, City B will pick their player who will play second. Then, City A will choose who they wish to put up against City B’s choice. Now, City A plays first, and City B plays second. Each player receives 1 throw and does their best trick. At the end, the three judges will render a vote for the player they feel played the best. That player’s team wins 1 point. This cycle continues until all 5 players from each team have played, with each battle being worth 1 point. At this end, the team with the most points is the winner. Is there anything that is overlooked or not clear? And which do you think is better…pick first or play first? Episode 83: Doug E Fresh Top 10 – Are You a Serious Jammer? City vs City – 4 cities will battle it out for the championship. What city will be crowned Heinsville for 2019?